David Lynch wasn't at Comic-Con, but his presence was felt throughout a damn good panel. Because “Twin Peaks” creators David Lynch and Mark Frost were unable to attend the series’ Comic-Con panel in San Diego, the director created a video greeting for the fans. And, as you can imagine, it was beyond words. But since the short film has yet to be released, we’ll try to do it justice. Lynch’s message never got past a simple greeting — “Good afternoon, ladies and gentleman” — but he made the most of a static camera in a dark room. Pointed at the director sitting in a wooden chair, Lynch kept getting distracted by action offscreen. First, someone walked out a door and fell, presumably, to his death. Then Lynch showed off a clinched hand holding a golf ball he described as “the last golf ball O.J. Simpson hit before going into prison in Nevada” before the camera cut. When it started up again, a horse, a gun, and a cat were involved. Aptly, describing that video is about as easy as describing “Twin Peaks,” the very job the cast was there to do at Comic-Con. Kyle MacLachlan, Naomi Watts, Tim Roth, Dana Ashbrook, Kimmy Robertson, James Marshall, Everett McGill, Matthew Lillard, and Don Murray joined “Twin Peaks: A Damn Good Panel,” moderated by “The Leftovers” co-creator and “Twin Peaks” mega-fan Damon Lindelof. 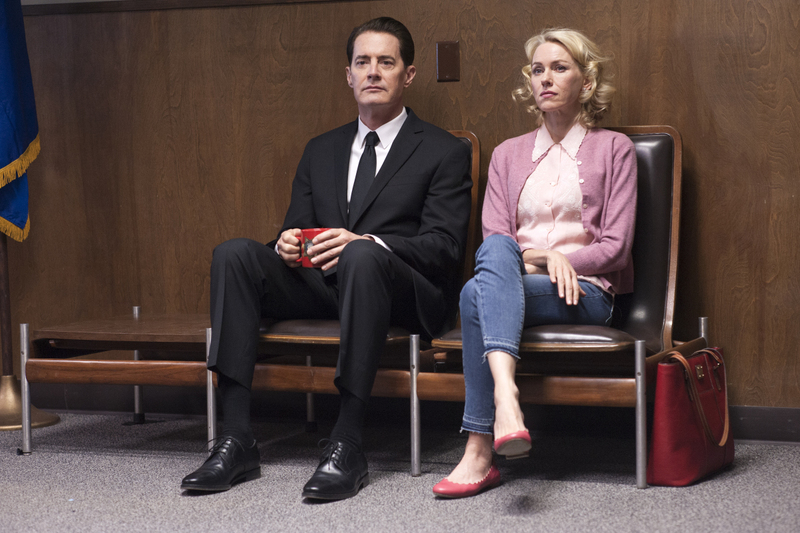 The group shared what it was like to work with David Lynch, how they found out about “The Return,” and how much of the series they’ve actually seen. Highlights are listed below, but fans take note: Starting August 6, “Twin Peaks” will air at 8 p.m., an hour earlier than it’s been airing every Sunday. Until then, enjoy the highlights. Part of that statement proved to be true. As the panel progressed, each cast member unveiled how they watched (or didn’t). Lindelof asked Lillard about him not watching the original series before he was cast in “The Return.” His response? “I’ll watch it tonight,” Lillard said, before noting how he is watching the new episodes. The crowd laughed and clapped a little before Lillard continued. Watts, on the other hand, hasn’t seen the new episodes. Roth, who also hasn’t been watching the new episodes, has an even more ambitious plan in mind. Later in the panel, a fan called out the cast for not keeping up with the new episodes, but Lindelof was quick to come to their defense. “Hey! They’re waiting to binge it!” Lindelof said. It is, after all, an 18-hour movie. One of the most widely debated new aspects of “The Return” is Dougie, a clone of Agent Cooper who Cooper’s evil doppelgänger used to keep from returning to the Black Lodge. But now everyone thinks the real Cooper is Dougie, and he’s been in no condition to correct them. Quiet, largely immobile, but still in love with a damn fine cup of coffee, the new iteration of Cooper has provoked quite a debate about what’s going on with Cooper. Only two cast members chose to speak. First, Watts said her “hot take” on Dougie was that “he’s hot.” But Robertson gave an answer the cast really enjoyed. There you go, folks: “Dougie” represents suburban complacency. Continue reading for the cast’s sweet stories on what it’s like to work with David Lynch.